The international art scene may focus its jetsetting on the big name destinations on the gallery circuit, with cities like New York, Paris and London dominating the psyche and leaping to mind as art-rich travel destinations. Often (although increasingly less) overlooked is Tokyo – a city simply packed with visual sensations for the dedicated aesthete and casual browser alike. From large scale national and commercial galleries to tiny tucked away gems, Tokyo offers a sprawling world of the visual arts just waiting for exploration. The Ginza district in Tokyo alone plays home to a staggering 400 plus galleries, and just by meandering the streets it is impossible togo half a block without stumbling upon an exhibition space or small commercial gallery worth poking one’s head (or whole body) into. One of my favourites is the Shiseido gallery, located in the basement beneath the Shiseido store on the main street Chuo-dori in Ginza. A small and architecturally interesting space, the gallery hosts regularly changing exhibitions and installations across wide-ranging media by contemporary Japanese artists. A similarly basement-housed artspace in the Marunouchi area of Ginza is Gallery Art Point (GAP), a contemporary gallery showcasing the cutting edge of Japanese art, through a range of visual and print media, sculpture, installation andperformance art. Located directly above GAP and posing a stark contrast in terms of contents but of no less interest is Seikodo Ltd: a narrow space dedicated to the art of traditional samurai armour and weaponry, it is a must for antique and history enthusiasts. On the ground floor of the same building is the Art for Thought gallery and attached café, exhibiting progressive pieces in print of different forms – whether they are framed, or on T-shirts. All artworks are for sale here and include the works of both budding artists and art students from colleges across the city. Bonus – the café offers a delightfully art- surrounded spot for afternoon tea! The Ginza Graphic Gallery (GGG or 3G) was founded by Nippon Printing Co and produces digital illustrations, and hosts exhibitions by artists ranging from the world famous veteran to the just-emerging. 3G also holds open talk evenings and workshops and other collaborative activities, and is a constant learning space for Japanese artists engaged in photography, graphic design, graphic art media and typography. Another area absolute full of galleries is the so called ‘Art Triangle’ in Roppongi, home to many commercial galleries amidst the skyscrapers of one of Tokyo’s most exclusive neighbourhoods. 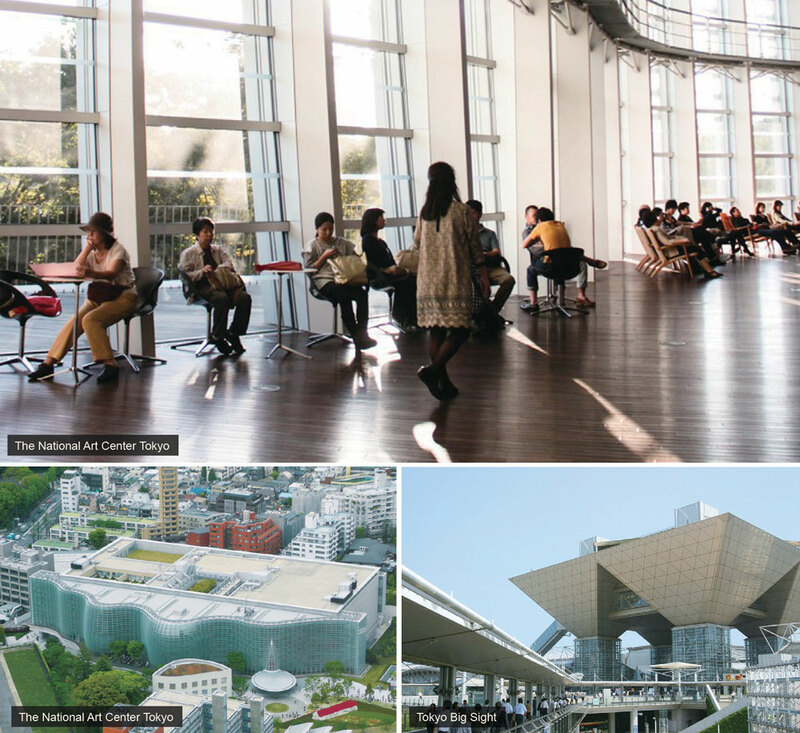 Most notable of these is the Mori Art Museum, which occupies the top floor of a 54-storey building in the heart of Tokyo’s entertainment district. With a constantly rotating selection of ambitious and outstandingly curated contemporary shows, the Mori Museum is the major gallery name in the Tokyo art scene. Also well worth a visit amongst the selection in Roppongi is the Suntory Museum of Art, nestled within the Tokyo Midtown shopping complex in Roppongi Hills and host to a range of exhibitions across different media. In addition, Tokyo Midtown itself is a beautifully architectured setting, with glamorous boutiques, restaurants and landscaped grounds and water features. The SCAI The Bathhouse gallery is, as its name suggests, tucked away in a traditional neighbourhood in Taito-ku, and housed in a renovated 200-year-old former bathhouse. Retaining the original fittings from the era, the juxtaposition of the traditional Japanese interior against the fascinating contemporary installations and exhibitions by some of the top names of the Japanese art scene provides an utterly intriguing visual experience. For the cutting, and often gritty, edge of contemporary Japanese photography, the Taka Ishii gallery in Koto-ku is a must for any art itinerary with a second space in Roppongi for film-based media installations, the gallery also exhibits and sells in Kyoto and internationally. Tokyo also hosts world class art and design events, the biggest of which is the Design Festa, held twice annually in Tokyo Big Sight. Representing the perfect fusion between commercial marketability and experimental small-scale art endeavours, the Festa serves as a platform for over 10,000 artists, designers, musicians, actors and more to exhibit and share their artistic visions, and since its inception in 1994 has welcomed professionals and ambitious amateur exhibitors alike in a melding of creative minds and talent. The Festa maintains a linked exhibition and creative space in the small backstreets of Harajuku, the Design Festa Gallery. According to the website description, the Gallery is “devoted to supporting freedom of expression regardless of an artist’s age, nationality, language or preferred medium” – and by association, income; at the heart of the Gallery’s mission is providing a space where upcoming artists can sell and exhibit their works free without commission fees. The ever-changing space, covered top-to-bottom and inside-out in murals and graffiti art, has 71 different exhibition spaces across its East and West wings, and all pieces are by young upcoming artists and designers, and can be bought directly from the floor. There’s also a café and bar on site, notably serving delicious okonomiyaki (my favourite in Tokyo!). For those interested in finding out more about what exhibitions and public art events are happening in Tokyo at any given time, check out Tokyo Art Beat (www.tokyoartbeat.com), which has an English language guide to events, reviews, reports and photos of the art scene, both mainstream and offbeat.